I am using flowheater to import a CSV file into a Microsoft Excel file. Is there a way to append the records in the Excel file instead of overwrite them? 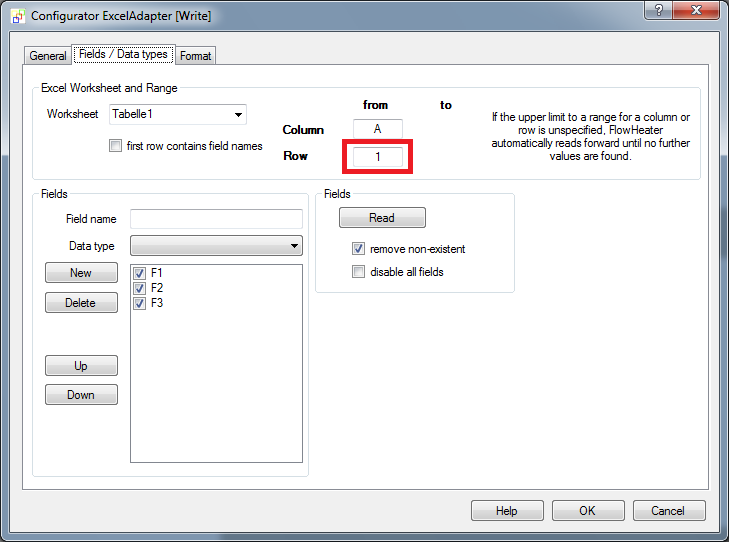 by now the flowheater excel adapter doesn´t support this feature. but you could do this with the .net script heater and the following vb.net script code. move one .net script heater into any current pipe/connection. double click on the heater to open the config dialog. switch the script language to vb and copy the script code above in the text area. the script code opens the excel workbook (if exist) and search for the first empty row by comparing the first column. you can change this; see the comment in the script. note: the script change the property rowfrom in the flowheater definition; see the screenshot marked in red. if you save the definition after execution by the execute and test window these are the next offset for searching the first free row. i've made a simple example; please have a look to the attachment excel-append.zip.